I had the Lync 2013 High CPU Usage issue probably a couple of years ago, also a colleague of mine complained of the same issue and then a few more came out. The issue wasn’t just the high CPU usage, in fact Lync was very slow and barely usable. All we had in common, besides Lync 2013, was that we all had DELL Laptops. I was running on a DELL Latitude E6430/Windows 8.1 x64. The solution in all of our cases was to uninstall the IDT Audio Package (might be called IDT High-Definition (HD) Audio Driver). That worked great and I then downloaded the latest drivers from the DELL website and all kept working just fine. 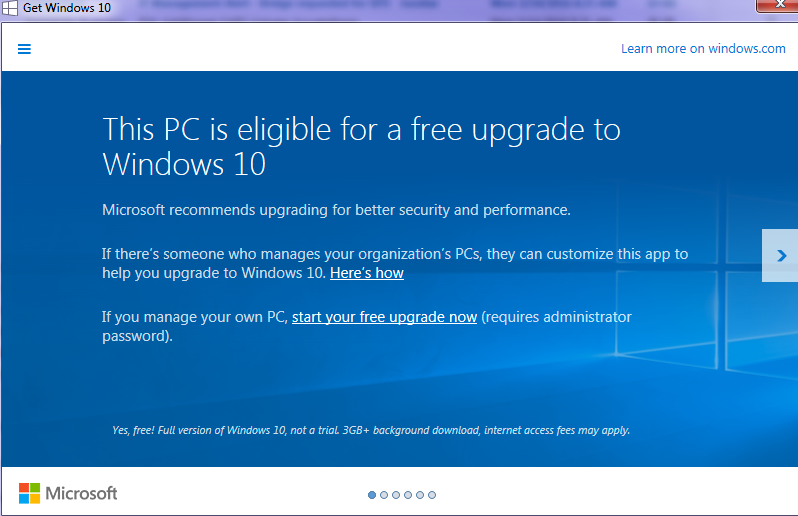 If you’re receiving a pop-up on your Windows 7, Windows 8 and Windows 8.1 client that tells you that This PC is eligible for a free upgrade to Windows 10, then you’re probably running an OEM version of Windows. If this is happening at work and you know you should have a version of Windows Volume License, then you might have found a client wrongly imaged as Windows 10 is free to be upgraded only on OEM version of the OS (at least until today 17th of March 2016). Check out this article about Check what type of Windows License is installed. Either ways, let’s see how we can get rid of This PC is eligible for a free upgrade to Windows 10 prompt. I set up a GPO for it, but I used the registry to make the change and not any Policy Template.